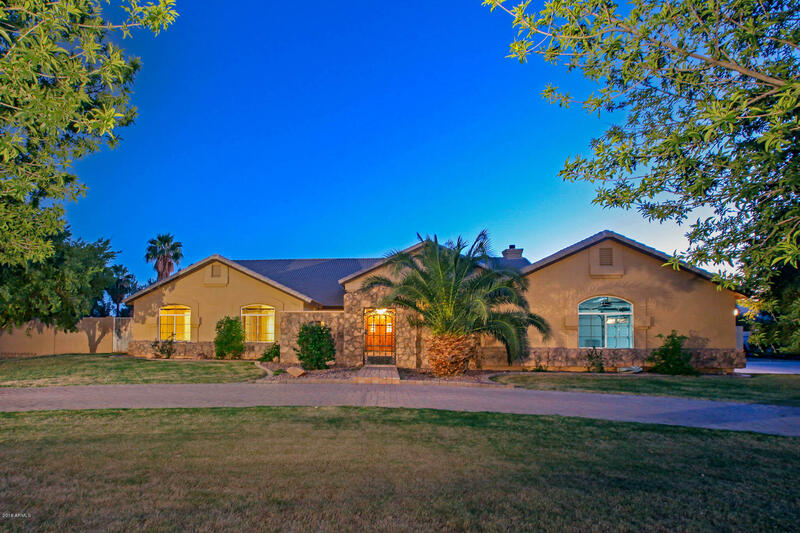 This amazing home on horse property in Circle G at Queen Creek is waiting for you. Gorgeous single story, 4-bedroom, 2.5 bath, with a den, sits on just under an acre corner lot. Comes with a 3-stall mare motel, RV gate, private pool, wine cellar and much more. When you first enter into the completely paved courtyard entrance you will feel the beauty of this home. The kitchen is a Chef's dream, loaded with stainless steel appliances, double oven, large island, and granite counters! Surrounded by rock trim throughout makes this home a rustic beauty. Travertine tile and new wood looking flooring in all bedrooms and den make for easy maintenance. Walk outside to a grandiose Mare Motel that opens to an irrigated pasture. The one of a kind tiled roof Mare Motel includes 3 stalls and hay storage.